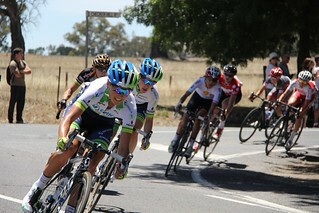 Our friends Nikki and Gethin are out in Adelaide, and sending us daily reports from the women’s Tour Down Under. Thank you so much! I’ll be adding any videos of the day’s stage to the bottom of the post as I find them. Action moved to the 2km long city centre Crit course in Rymill Park, central Adelaide for Stage 2 of the Santos Women’s Tour. The women were sharing the stage with the People’s Choice Classic – the traditional curtain raiser for the men’s event which followed on immediately afterwards, so benefited from much bigger crowds than at Stage 1 yesterday. It was another great day for Orica AIS as Mellisa Hoskins beat out Kimberly Wells of High 5 Dream Team. The bunch sprint meant that Valentina Scandolara retained the leader’s jersey that she gained in an attack-fest Stage 1. To stream the cobbliest, whisky-ist podcast ever click here. To subscribe in iTunes click here. There are some lovely photos of the Sluitingprijs by Balínt Hamvas on his site cyclephotos.co.uk. If you like cyclocross, or know someone who does, you can pre-order Balínt’s 2013-14 season book – with words by our friend Caro, who’s the reason Sarah’s into CX in the first place.